If you don’t know the rules, here’s the upshot: You get a deck full of 2 mana 2/3 pirates. 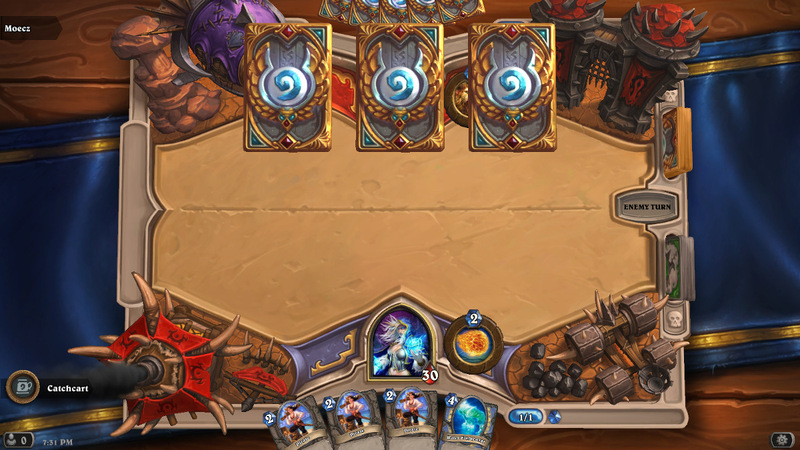 Your starting hand is drawn from this deck, so mulligan all you want, you still only get pirates. However, instead of drawing from the deck each turn, you get to discover a card, i.e. the standard pick-one-in-three. You can still draw from the deck to get more 2/3 pirates using the draw mechanics of various cards but after you’ve used up your starting hands’ supply you’ll only have cards you have discovered. I’m assuming that the same card distribution is used here as in Arena with some cards occuring much more frequently than others, e.g. you’ll hardly see a mage game without a firelands portal and a medivh’s valet. The opening hand. My first pick was a water elemental, a solid pirate killer that also has potential use in the early midgame. So what does this mean? Well, the first two turns will likely be pirate on pirate action – or rather a pirate on pirate standoff as the general tactic is to hope for a three or four drop that will make the trades more favourable to you, e.g. a flamecaller or a maelstrom portal. After that the board tends to swing a lot in the midgame until either one party establishes themselves on the board or the mage gets enough direct face damage in. The effect of the opening hand is pretty obvious: It all but banishes aggro play. Those opening turns are mostly symmetrical and very slow. While the format can resemble an improv arena, this opening makes for a slower experience. This is just after my turn four play. When going second you’re at an advantage because of the small likelihood of player one getting a one-drop. So you can coin out a pirate on turn one, add another on turn two and ideally get an edge on turn three by smacking pirate into pirate and add some one-damage AOE effect. Going first you often have to wait to turn four to make such plays. Here Spell Slinger gave me a Revenge spell on turn three and allowed me to kill two pirates down to one health on turn four and throw in an additional pirate. While my opponent dominated the start, this is the first minor tempo swing. So can you approximate a midrange style then? Not really. I guess it depends on definition but if we can agree that midrange games tend to be decided between turn 5 and 10 then this is not midrange. Because the board advantages you get tend to be so slim, the board often continues to fluctuate throughout these turns. As for fatigue, this is not a consideration as you so rarely draw from your deck (and I don’t think that the discovery burns a pirate card each turn). What it boils down to is the the Treasure format is really control versus control. How much control? Well, I think I won a game largely thanks to picking an early Darkscale Healer. That much control. This means that there is a lot less time pressure in most phases of the game. You have to think about the board from early on but you’re not under threat from aggros and in the other end there isn’t much a chance of OTK stuff. You can mostly see the game state on the board but obviously there are exceptions. For example, Antonidas makes frequent appearances so it is possible to build up a large hand of fireballs and finish the game that way. Or a rogue can contest the board while using boomeranging headcracks to get you down. It also means that you have to improvise with the tools you’re given. 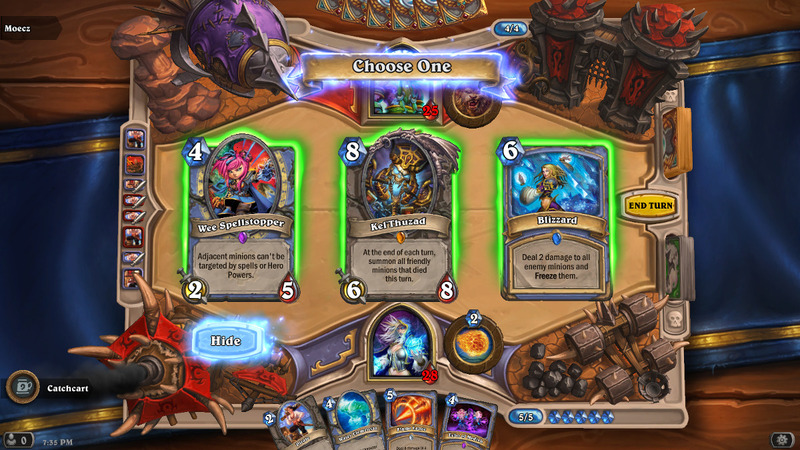 You have to think about whether you’re picking for now or for three turns off. These are choices informed by a lot of things. You have to consider tempo versus value: Do I pick the decent three-drop on turn three or do I pick flame strike for turn seven because, well, flame strike. This was the last turn of the game, sadly as my opponent quit. But it shows something about card choices. Mages are generally offered a lot of the strong removal cards and it’s tempting to just go nuts in the portals ‘n fireballs department but I prefer to diversify a bit. You should always have at least one piece of removal – in this case a solid flame lance that should clear up almost anything but an old god or a sogoth – but also think about card draw as most games will go long enough to justify it. Echo of Medivh can be a game winner if you can get copies of two or more heavies in hand on a turn 10+. Here I hesitated because while Kel’Thuzad is good he does somewhat depend on the same condition as Echo of Medivh to gain value. Still I was ahead on the board and short on minions in hand so I would probably have picked it over the also-tempting Blizzard. You have to consider what you can allow yourself depending on you opponent’s class: I learned the hard way that playing Ice Block on turn three – to have in place for synergy with cards like Medivh’s valet and Ethereal Arcanist – was too slow even in a control game. Most control games in constructed are hardly wildy creative and fun – control warrior is where fun goes to die in my opinion – but because you have to nail . down the tracks as you’re running there is a much greater degree of improvisation. This keeps you constantly scanning your hand for unexpected synergy. In constructed you’re mostly just looking for recognisable and known combos which is a very different thing. It certainly makes for more skilled play as you have more solid ground on which to do your math and so rewards the better player with more wins. My point is not about skill but creativity which adds to skill, certainly, but is also a different thing. 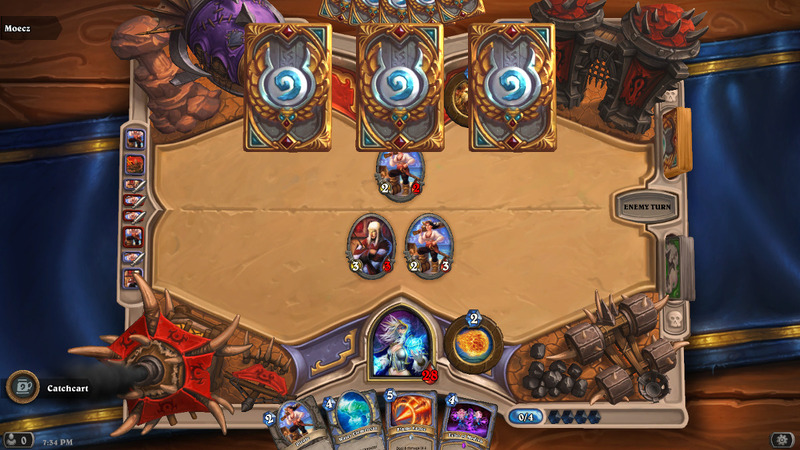 Constructed freeze mage is a bore but when you suddenly get a chance to freeze your opponent’s board on one turn, knowing that you can follow up with Vanish (!) the next you have something new and different and in my opinion, more creative. It’s easy to say when you’re the one doing the punishing but I also lost games that left me with a big grin on my face. Or scratching my head as in the excceptional (and unexplicable) case of the druid that killed me with an innocuous 8/8 giant that suddenly was a 22/11. Now there are a lot of RNG-branded tavern brawls and I probably play them all and enjoy them for what they are. And my defense for this particular one is mainly that it allows for more creativity and more control centered play than constructed. But I should also point out that while it doesn’t reward skill as much as constructed it does so more than e.g. Randomonium. You could say that it is somewhere in between on that spectrum. Randomonium allows experts to be easily defeated by beginners. Which is perfectly fine because well, I can see the fun in that. 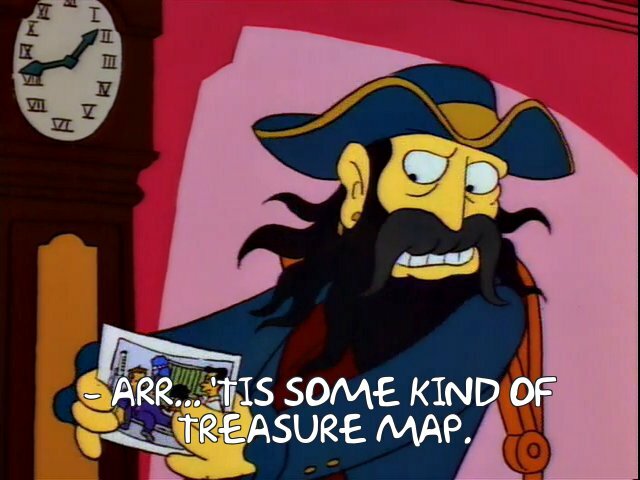 My point is simply that I don’t think that is possible in Captain Blackheart’s Treasure as you need to make a lot more choices and every choice comes with an appropriate cost. You can still loose to newbies if you’re only offered 1 mana cards on turn 15 but that is not the same as loosing on turn two because your opponent got a discount on Ragnaros. To summarise, these games go long but not into the dreadful abyss of control warrior fantasies. They are never resolved in the first four turns – or even necessarily in the first ten turns. They go back and forth. They often require you to rethink your hand and your strategy which means that you have something to do while waiting for your opponent to choose. If I was to sum it up in a word? OK, three words? How does “fun and interactive” śound?